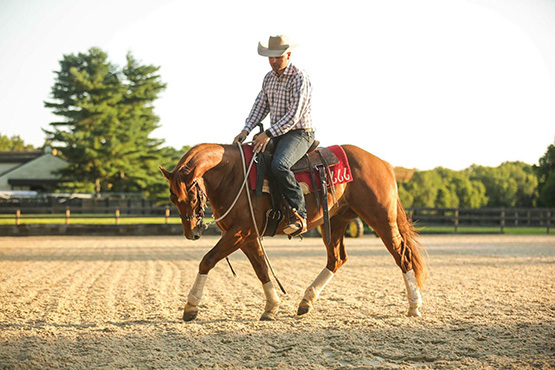 In order to qualify for the chance to win BOONS KNOCKOUT (Lucky #7), a person must hold valid membership as a Road to the Horse Roadie, as well as membership as a Double Dan Horsemanship Insider Membership at the time of the Road to the Horse 2018 event. The winner will be selected by random draw and does not have to be present to win but must be a US resident. Winner will be responsible for shipping costs from Lexington, Kentucky to their home address. Learn more about Road to the Horse 2018 Roadie Membership here. 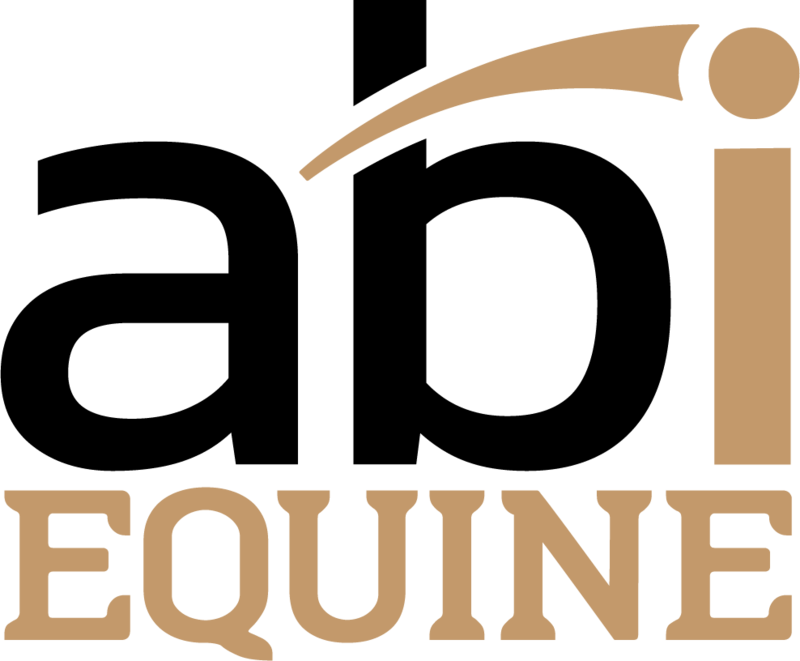 If you would like to be entered for a chance to win the 2018 Insider Horse, please log into your DDH Insider account and complete the form here. SIRE- BOON SAN: (2003) (HIGH BROW CAT- BOON SAN SALLY by BOON BAR).Full brother to BOON SAN KITTY and RW SALL YCAT; BOON SAN, earner of $57,580 in cutting events and a full brother to NCHA Horse of the Year BOON SAN KITTY, earner of $565,000, who produced NCHA Futurity Champion and 6666 stallion ROCKIN W, earner of $329,000. BOON SAN’s first performers include BOON SAN BABY ($197,332: NCHA Limited Open Futurity Co-Reserve Champion; 4th, NCHA Open Futurity, 3rd NCHA Open Super Stakes). HIGH BROW CAT has lifetime earnings of $110,784 and has offspring earnings in excess of $63,000,000. 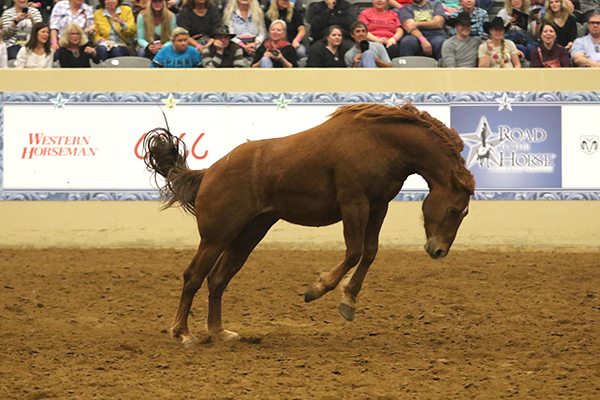 DAM -SIXES KNOCKOUT: ( 1994) SIRE SEVEN, FROM HEAVEN is an AQHA World Champion Cutting Horse Earner of $72,732. At three, Valley RCHA Fresno Open Futurity Co-Reserve Champion. At four, split 3rd, Memphis 4-Year-Oid Open Futurity; finalist in the Galles Ranch Open Derby; semi-finalist in the NCHA Open Derby. At five & six, 2004 West Texas Open Classic Reserve Champion; finalist in the 2004 NCHA Super Stakes Open Classic and the 2005 & 2004 Augusta Open Classics; In AQHA events, 2004 AQHA World Champion Junior Cutting Horse and winner of the Preliminaries. NOTE: Road to the Horse 2012 World Champion colt, REMEMBER SUNSET (aka Swampy) is sired by SEVEN FROM HEAVEN. PHOTO: Dan Steers riding Lucky #7.